Looking for a Used RC F in your area? CarGurus has 224 nationwide RC F listings starting at $34,333. For too long, the the performance coupe market was limited to the same three German entrants: The BMW M3 came first, and was eventually joined by the RS4, RS5, and C63 AMG. But now Lexus is crashing the party with its 2016 RC F, a V8 muscle-bound coupe that catches the eye and gets your heart racing. The 2016 Lexus RC F is based on the new RC coupe lineup. While the other RC models feature inline-4 or V6 engines, however, the RC F features a potent 8-cylinder engine that announces its arrival with a mechanical wail. And once you see the car coming, its appearance will make it hard to take your eyes away. The big 19-inch wheels are wrapped in low profile tires and framed by bulging fender flairs. The front of the RC F incorporates a massive grille framed by large, functional vents, and out back, the RC F boasts an active aero rear wing that deploys at 50 mph and retracts when you come back down below 25 mph. The spoiler can also partially raise in response to other variables and drive settings. The RC F's interior is an artful blend of form and function. Crisp straight lines frame a driver-centered cabin full of features geared towards both performance and comfort. The F SPORT performance bucket seats hold the driver and front passenger snugly during hard cornering, and the carbon fiber interior inserts (be they for weight reduction or merely the aesthetic) remind you of the car's performance nature. The RC F also features the Lexus Remote Touch system, which provides access to nearly all of the vehicle’s functions through a touch-sensitive directional pad located near the shifter. This pad lets the driver control the infotainment screen in the center dash by scrolling with a finger, operating functions like audio and climate controls, navigation, and realtime updates for traffic, weather, sports, and stocks. Underneath the RC F's curving hood is a 5.0-liter V8, which is something of a unicorn in today’s world of ever-shrinking eco-minded engines. That is not to say the V8 is prehistoric--its 467 hp and 389 lb-ft of torque are delivered using 4 cams and intelligent variable valve timing. Power is sent through an 8-speed sport direct shift automatic transmission with steering wheel mounted paddle shifters to a rear wheel drive (RWD) system that features a Torsen limited-slip differential. This setup is good for a 0-to-60 time of 4.4 seconds and a top track speed of 168 mph. Despite this incredible performance, the V8 drivetrain also manages fuel economy of 16 mpg city/25 highway. The RC F rides on an advanced double wishbone front and multilink rear suspension, while the steering system is speed-sensitive and has an F SPORT adjustable mode intended for harder driving. Brembo disc brakes bring the RC F to a stop with big 15-inch ventilated disc rotors in the front and 13.6-inch ventilated discs in the rear. Depending on the options package selected, the 19-inch wheels are wrapped in either Bridgestone Potenza or Michelin Pilot Sport PS2 tires--both of which are designed specifically for the RC F.
Base MSRP for the 2016 Lexus RC F is $62,805. Four basic colors are available, and three exclusive colors (including the day-glow orange) are available only with the $4,400 Premium Package, which includes heated front seats, rain-sensing wipers, triple-beam LED headlights, a blind spot-monitoring system with rear cross traffic alert, and black carbon fiber interior trim. Another available package is the Performance Package ($5,500), which includes the torque-vectoring rear differential, a carbon fiber rear wing, heated and vented front seats, and other gear from the Premium Package. Add one of these, along with navigation and a Mark Levinson Premium Stereo, and you could pay upwards of $76,000 for your RC F.
In truth, the Lexus RC F is not as much a refined purist’s machine as is the BMW M3 or M4. BMW has simply been at it too long not to keep at least slightly ahead of the competition. But the M3 and M4 are also a little stiff, and tend to be a lot to manage when entering the performance coupe market for the first time. What makes the 2016 Lexus RC F compelling is that it is a wonderful way to get into the “luxury muscle car” game with a ride that is as eye-catching as it is fun to drive! 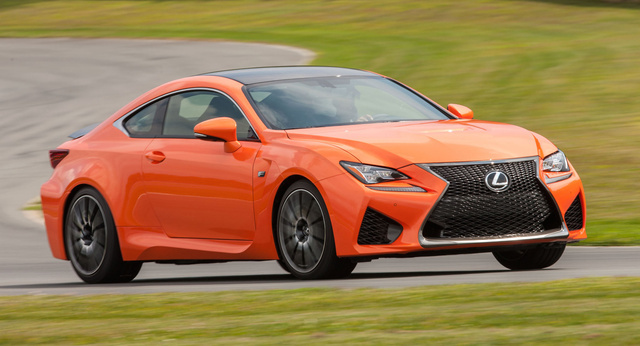 What's your take on the 2016 Lexus RC F? Have you driven a 2016 Lexus RC F?